Yes - Netherlands 33-10 Sweden full-time apparently. Confirmed that Netherlands v Sweden was a "training game" and not a test match. johnbirch wrote: Confirmed that Netherlands v Sweden was a "training game" and not a test match. Maybe somebody can enlight me, what the sense with that is. I honestly have no idea. Two absolutely amateur sides play each other, but why on earth don't they make it a full test? Last edited by RugbyLiebe on Thu, 18 Oct 2018, 09:43, edited 1 time in total. because it would affect the World Rankings. And you just don't do that! You are right. What a crazy thing to do, to have more than one or two ranking games per year. Stupid me. Back from sarcasm, now serious: why on earth? It's women's 15s. Not many people apart from the one's directly involved care about it. Why bother to make a difference? To not create something you could use for promotion? I think it's a false trial, even if you are theoretically right. 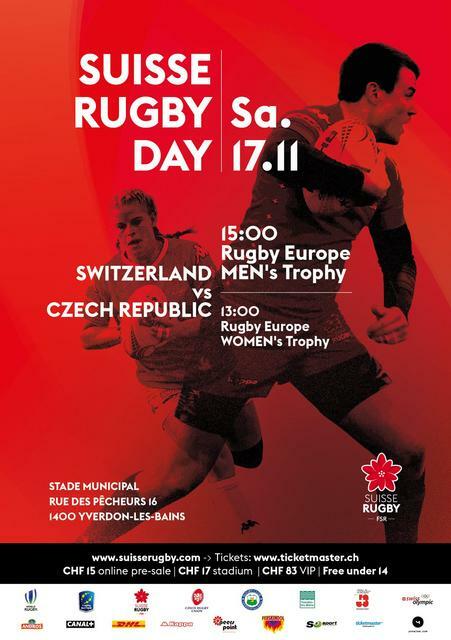 When we know that Women's Trophy exists only thanks to the obstinacy of the Swiss federation, it's already a good thing that the announcement of the women match appears so high in the poster with a women player's photo while in France or in England, it would doubtless appear at best only at the foot of the poster. Disappointingly you are probably right. I wonder - is there a cost reason? Is there some minimum WR requirement for an official test match which makes it easier and cheaper - especially for small nations - to call the games "development internationals" instead? It cannot just be about wanting to hang onto ranking points, surely? More on the status of this game. The Czechs defintely awarded caps, and treated it as a test, and the Germans apparently did likewise. But the DRV (German Union) neglected to apply for test status from World Rugby. So make of it what you will. I am left wondering if the DRV would have forgotten to apply for test status for one of their men's games. FER schedule originally marked this as a game against 'Northumberland Barbarians'. Three tries by Michela Sillari, one each by Valentina Ruzza, Ilaria Arrighetti and Giordana Duca. Three new debutants for Italy: Benedetta Mancini, Francesca Sberna (both already in the 7s national team) and Camilla Sarasso (never in a national team, as far as I know). Total dominion by Italy, apart some spare moments with two tries saved at the last second by Sillari. is the Pacific stuff for real? If it is, PNG will be the only team that plays female XV while not playing the XV male format. I don't know how much of that 38-0 is by virtue of Italy and how much by weakness of Scotland, so it's too early to talk about real improvement in my opinion. Scotland game seemed very poor, but maybe the a-tempo and aggressive italian defense had a role in it.